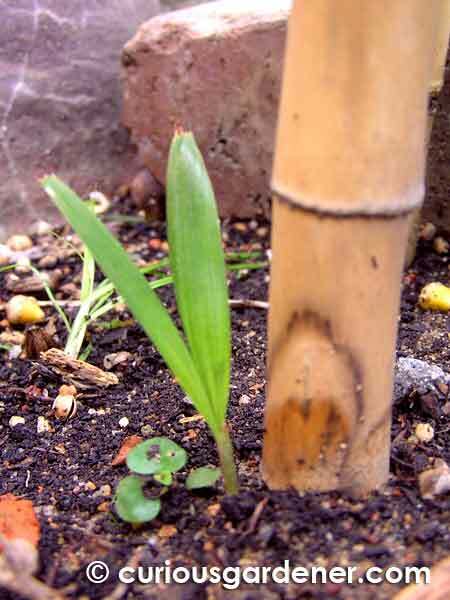 I was out taking a look at my plants one evening when I noticed a different plant growing in my big pot of Japanese Bamboo (Dracaena Surculosa). It had obviously sprouted within the last few days, because the two halves of the seed bean it had grown from were still attached to the stem. This particular pot of Jap bamboo tends to have lots of “visitors”. The big pot sits just under the edge of our mango tree canopy, and it’s bushy enough to attract birds to perch on it frequently. There are always lots of weeds and uninvited plants growing in it that have to be extracted. However, this time, something made me pause. Maybe it was my new “inner veggie gardener” telling me to hold on for a minute. 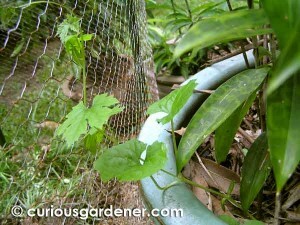 I took a photo of the 15cm high vine, and posted it on the GCS forum to see if anyone could identify it. In less than 2 hours, as many people said it looked like a bittergourd plant. In fact, a couple of days later, I showed it to my mum. Surprising us both, she blurted, “That’s periak” – the Malay name for bittergourd. Seeing the plant had triggered memories of her childhood, when they had grown the veggie. 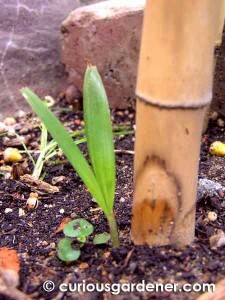 A sprouting palm tree at the base of my bean trellis. It could have been deposited by a bird, or dropped by the palm tree nearby. Now I know that no person planted that seed there, so it had to have been “deposited” by one of our feathered visitors. 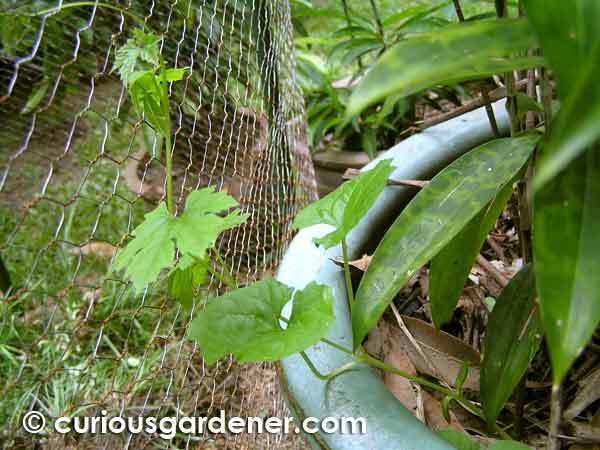 Not wanting to transplant and shock the plant, I redirected it so the tendrils found the fencing around my new compost pit, next to the pot. Yup, I had to break that self-imposed rule about not growing an edible creeper there, but it was either do that or let it smother the Japanese bamboo. This made me look into how birds help plants to disperse their seeds. We have an established curry leaf tree that produces clusters of berries. The birds love the berries, and we subsequently have lots of little curry leaf trees sprouting in the ground below wherever the birds perch to poop. The same goes for the berries of palm trees. Thanks to the birds, we’ve had several different varieties of palm trees growing here at one time or another. 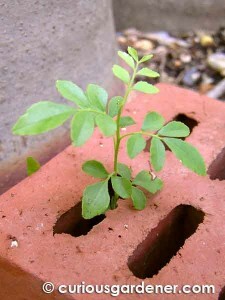 Curry leaf plant sprouting from the crevice of a brick next to the fence - obviously deposited there by a bird, because there's NO parent plant that close! My initial assumption was that birds only dispersed seeds by pooping them, but research taught me that they also regurgitate them. Urk. Their digestive systems can’t process hard things like, oh, the exoskeletons of insects, undigested bones, hairs and feathers, so they eventually spit them out in a process known as pellet casting. Good to know, huh? Lighter and/or hooked seeds can hitch a ride on creatures that feed on them or simply pass by. Or they can be spread via wind, water or explosive action on the plant’s part. (Here, I get the image of a drawing of the balsam plant in my head, thanks to old school books…) But then, that’s how my Peacock trees disperse their seeds – another reason we have lots of them sprouting all over the garden, too. Dispersal is just Nature’s way of conducting a lucky draw – and for people like me, it’s an exciting event, because I never know what’s going to start growing in the garden until I see it!